Definition at line 44 of file llnotify.h. Definition at line 47 of file llnotify.h. Definition at line 48 of file llnotify.h. Definition at line 152 of file llnotify.h. Definition at line 159 of file llnotify.h. Definition at line 172 of file llnotify.cpp. References LLFloaterChat::addChatHistory(), LLView::addChild(), LLFontGL::BOLD, BOTTOM, BTN_HEIGHT, BTN_HEIGHT_SMALL, CHAT_SOURCE_SYSTEM, DB_FIRST_NAME_BUF_SIZE, DB_INV_ITEM_NAME_BUF_SIZE, DB_LAST_NAME_BUF_SIZE, FALSE, FOLLOWS_BOTTOM, FOLLOWS_RIGHT, FOLLOWS_TOP, LLAlertDialog::format(), gColors, LLView::getChildCount(), LLControlGroup::getColor(), LLRectBase< Type >::getHeight(), LLUIInstanceMgr< LLFloaterChat, LLFloaterChat >::getInstance(), LLFontGL::getLineHeight(), getNotifyRect(), getNotifyTipRect(), getTemplateMessage(), LLRectBase< Type >::getWidth(), gNotifyBoxView, HPAD, i, mAnimating, mBtnCallbackData, LLNotifyBox::InstanceAndS32::mButton, mDefaultOption, mIsCaution, LLView::mIsFocusRoot, mIsTip, mMessage, mNextBtn, mNumOptions, LLView::mRect, LLNotifyBox::InstanceAndS32::mSelf, LLChat::mSourceType, mUnique, NULL, onClickButton(), onClickNext(), S32, LLUI::sColorsGroup, LLTextBox::setBackgroundColor(), LLPanel::setBackgroundOpaque(), LLPanel::setBackgroundVisible(), LLTextEditor::setBorderVisible(), LLTextBox::setBorderVisible(), LLTextBox::setColor(), LLPanel::setDefaultBtn(), LLButton::setDisabledImageColor(), LLTextEditor::setEnabled(), LLView::setFollows(), LLButton::setFont(), LLTextBox::setFontStyle(), LLTextEditor::setHideScrollbarForShortDocs(), LLButton::setImageColor(), LLUICtrl::setIsChrome(), LLView::setMouseOpaque(), LLRectBase< Type >::setOriginAndSize(), LLTextEditor::setReadOnlyBgColor(), LLTextEditor::setReadOnlyFgColor(), LLView::setRect(), LLUICtrl::setTabStop(), LLTextEditor::setTakesFocus(), LLTextEditor::setTakesNonScrollClicks(), LLView::setToolTip(), LLView::setVisible(), LLTextEditor::setWordWrap(), LLTextBox::setWrappedText(), sFont, sFontSmall, sNotifyBoxCount, sOpenUniqueNotifyBoxes, LLFontGL::sSansSerif, LLFontGL::sSansSerifSmall, TOP, LLColor4::transparent, TRUE, VPAD, x, and y. Definition at line 411 of file llnotify.cpp. References mBehavior, mBtnCallbackData, mMessage, LLView::mName, mUnique, NULL, and sOpenUniqueNotifyBoxes. Definition at line 165 of file llnotify.cpp. Definition at line 530 of file llnotify.cpp. References LLMortician::die(), LLNotifyBoxView::getFirstNontipBox(), gFocusMgr, gNotifyBoxView, mIsTip, LLNotifyBoxView::showOnly(), sNotifyBoxCount, LLFocusMgr::triggerFocusFlash(), and TRUE. Referenced by handleMouseUp(), and tick(). Definition at line 452 of file llnotify.cpp. References ANIMATION_TIME, LLPanel::draw(), drawBackground(), f, FALSE, LLTimer::getElapsedTimeF32(), LLRectBase< Type >::getHeight(), gNotifyBoxView, height, mAnimateTimer, mAnimating, mIsTip, LLView::mRect, LLUI::popMatrix(), LLUI::pushMatrix(), S32, LLNotifyBoxView::showOnly(), and LLUI::translate(). Definition at line 489 of file llnotify.cpp. References LLViewerImage::bindTexture(), LLFocusMgr::childHasKeyboardFocus(), gColors, LLControlGroup::getColor(), LLImageGL::getHeight(), LLRectBase< Type >::getHeight(), LLViewerImageList::getImage(), LLControlGroup::getString(), LLImageGL::getWidth(), LLRectBase< Type >::getWidth(), gFocusMgr, gImageList, gl_segmented_rect_2d_tex(), glColor4fv, gViewerArt, MIPMAP_FALSE, mIsCaution, mIsTip, LLView::mRect, LLColor4::mV, ROUNDED_RECT_BOTTOM, ROUNDED_RECT_TOP, S32, LLUUID::set(), and TRUE. Definition at line 150 of file llnotify.cpp. References LLAlertDialog::format(), NULL, and sOpenUniqueNotifyBoxes. Definition at line 72 of file llnotify.h. Definition at line 604 of file llnotify.cpp. References BTN_HEIGHT, LLRectBase< Type >::getHeight(), LLView::getRect(), LLControlGroup::getS32(), LLRectBase< Type >::getWidth(), gNotifyBoxView, gSavedSettings, LEFT, S32, TOP, and VPAD. Definition at line 640 of file llnotify.cpp. References end, FALSE, LLRectBase< Type >::getHeight(), LLFontGL::getLineHeight(), LLView::getRect(), LLControlGroup::getS32(), LLRectBase< Type >::getWidth(), gNotifyBoxView, gOverlayBar, gSavedSettings, HPAD, LEFT, llceil(), llclamp(), LLFontGL::maxDrawableChars(), S32, sFont, start, TRUE, utf8str_to_wstring(), and VPAD. Definition at line 762 of file llnotify.cpp. References FALSE, LLControlGroup::getF32(), gSavedSettings, sDefaultTemplate, and sNotifyTemplates. Definition at line 822 of file llnotify.cpp. Referenced by notify_cautioned_script_question(), and process_script_question(). Definition at line 808 of file llnotify.cpp. Definition at line 792 of file llnotify.cpp. Referenced by LLVoiceChannelGroup::handleError(), LLNotifyBox(), notify_cautioned_script_question(), and process_script_question(). Definition at line 73 of file llnotify.h. Definition at line 425 of file llnotify.cpp. References close(), LLView::handleMouseUp(), mIsTip, LLPanel::setFocus(), and TRUE. Definition at line 439 of file llnotify.cpp. 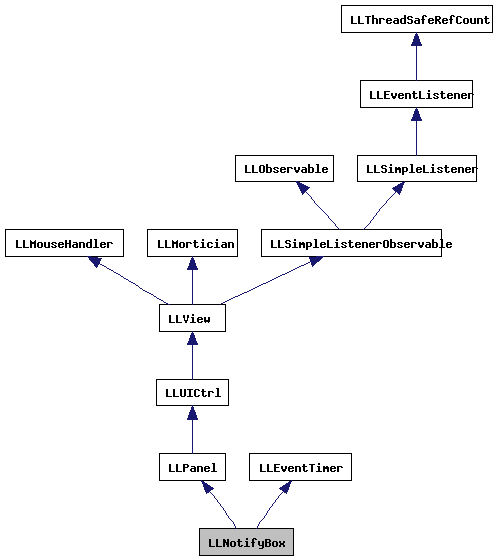 References LLView::getEnabled(), LLView::getVisible(), LLView::handleRightMouseDown(), mIsTip, moveToBack(), LLView::pointInView(), and TRUE. Definition at line 68 of file llnotify.h. Definition at line 67 of file llnotify.h. Definition at line 578 of file llnotify.cpp. References FALSE, LLView::getChildCount(), LLNotifyBoxView::getFirstNontipBox(), gFocusMgr, gNotifyBoxView, mIsTip, mNextBtn, LLView::sendChildToBack(), LLView::setVisible(), LLNotifyBoxView::showOnly(), LLFocusMgr::triggerFocusFlash(), and TRUE. Referenced by handleRightMouseDown(), and showXml(). Definition at line 727 of file llnotify.cpp. References LLNotifyBox::InstanceAndS32::mButton, LLNotifyBox::InstanceAndS32::mSelf, NULL, S32, and LLAlertDialog::showXml(). Definition at line 755 of file llnotify.cpp. Definition at line 836 of file llnotify.cpp. References FALSE, LLControlGroup::getF32(), LLUICtrlFactory::getLayeredXMLNode(), gSavedSettings, LLPointer< Type >::isNull(), llendl, llerrs, llwarns, NULL, S32, and sNotifyTemplates. Definition at line 567 of file llnotify.cpp. References mIsTip, mNextBtn, LLView::setEnabled(), LLView::setVisible(), and sNotifyBoxCount. Definition at line 129 of file llnotify.cpp. References LLView::addChild(), FALSE, findExistingNotify(), getTemplate(), gNotifyBoxView, LLNotifyBox(), and mBehavior. Definition at line 109 of file llnotify.cpp. References LLView::addChildAtEnd(), findExistingNotify(), getTemplate(), gNotifyBoxView, LLNotifyBox(), mBehavior, and moveToBack(). Definition at line 88 of file llnotify.cpp. Definition at line 81 of file llnotify.cpp. Referenced by auction_j2c_upload_done(), auction_tga_upload_done(), callback_load_url_name(), LLPanelLandObjects::callbackReturnGroupObjects(), LLPanelLandObjects::callbackReturnOtherObjects(), LLPanelLandObjects::callbackReturnOwnerList(), LLPanelLandObjects::callbackReturnOwnerObjects(), disabled_duplicate(), LLFetchInWelcomeArea::done(), LLFloaterSellLandUI::doShowObjects(), LLToolDragAndDrop::giveInventoryCategory(), handle_buy_object(), handle_claim_public_land(), LLPanelGroupRolesSubTab::handleDeleteRole(), LLVoiceChannelP2P::handleError(), LLVoiceChannelProximal::handleError(), LLVoiceChannelGroup::handleError(), LLToolsLink::handleEvent(), LLAvatarGiveCard::handleEvent(), LLAudioStreamMediaListener::handleEvent(), LLVoiceChannelP2P::handleStatusChange(), LLVoiceChannel::handleStatusChange(), inventory_offer_handler(), LLIMMgr::inviteToSession(), join_group_callback(), onClickBuild(), onClickFly(), onClickHealth(), LLFloaterAuction::onClickOK(), onClickPush(), onClickScripts(), onClickVoice(), LLIMMgr::onInviteNameLookup(), LLLiveLSLEditor::onLoadComplete(), LLPreviewLSL::onLoadComplete(), LLPreviewNotecard::onLoadComplete(), LLPreviewGesture::onLoadComplete(), LLGestureManager::onLoadComplete(), LLPanelFriends::onMaximumSelect(), LLPanelLogin::onPassKey(), process_accept_callingcard(), process_alert_core(), process_decline_callingcard(), process_improved_im(), process_money_balance_reply(), process_offer_callingcard(), process_script_dialog(), process_script_question(), LLWearableList::processGetAssetReply(), LLLandmarkList::processGetAssetReply(), LLAvatarTracker::processNotify(), LLViewerParcelMgr::processParcelProperties(), LLAgent::recoverMissingWearable(), LLViewerInventoryCategory::removeFromServer(), request_friendship(), LLPanelFriends::requestFriendshipDialog(), LLViewerParcelMgr::selectLand(), set_god_level(), LLAgent::stopAutoPilot(), terrain_download_done(), LLEventNotifier::update(), LLViewerInventoryCategory::updateServer(), LLNewAgentInventoryResponder::uploadComplete(), LLFirstUse::useAppearance(), LLFirstUse::useBalanceDecrease(), LLFirstUse::useBalanceIncrease(), LLFirstUse::useBuild(), LLFirstUse::useDebugMenus(), LLFirstUse::useFlexible(), LLFirstUse::useInventory(), LLFirstUse::useLeftClickNoHit(), LLFirstUse::useMap(), LLFirstUse::useOverrideKeys(), LLFirstUse::useSandbox(), LLFirstUse::useSculptedPrim(), LLFirstUse::useSit(), and LLFirstUse::useTeleport(). Definition at line 70 of file llnotify.h. Definition at line 558 of file llnotify.cpp. References close(), FALSE, and mIsTip. Definition at line 126 of file llnotify.h. Definition at line 120 of file llnotify.h. Referenced by draw(), LLNotifyBox(), and stopAnimation(). Definition at line 139 of file llnotify.h. Referenced by getNotifyCallback(), getUserData(), showXml(), and ~LLNotifyBox(). Definition at line 150 of file llnotify.h. Referenced by LLNotifyBox(), and ~LLNotifyBox(). Definition at line 142 of file llnotify.h. Definition at line 119 of file llnotify.h. Referenced by drawBackground(), isCaution(), and LLNotifyBox(). Definition at line 118 of file llnotify.h. Referenced by close(), draw(), drawBackground(), handleMouseUp(), handleRightMouseDown(), isTip(), LLNotifyBox(), moveToBack(), setVisible(), and tick(). Definition at line 116 of file llnotify.h. Definition at line 128 of file llnotify.h. 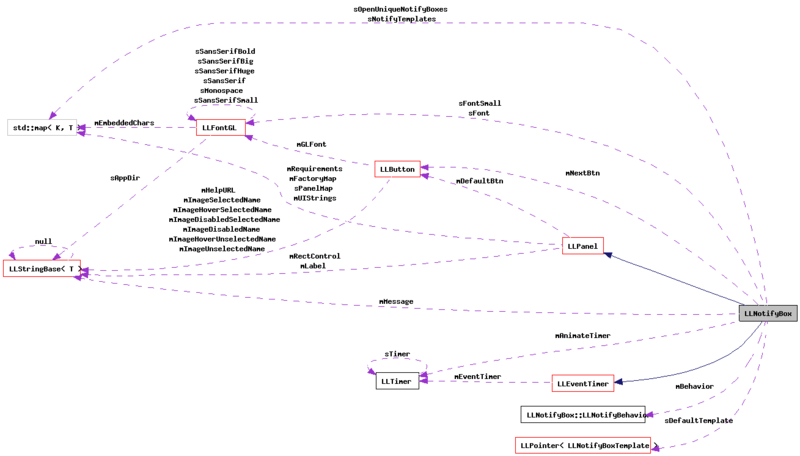 Referenced by LLNotifyBox(), moveToBack(), and setVisible(). Definition at line 141 of file llnotify.h. Definition at line 121 of file llnotify.h. Definition at line 113 of file llnotify.h. Referenced by cleanup(), and getTemplate(). Definition at line 156 of file llnotify.h. Referenced by getNotifyTipRect(), and LLNotifyBox(). Definition at line 157 of file llnotify.h. Definition at line 155 of file llnotify.h. Referenced by close(), LLNotifyBox(), and setVisible(). Definition at line 153 of file llnotify.h. Referenced by getTemplate(), getTemplateIsCaution(), getTemplateMessage(), and parseNotify(). Definition at line 160 of file llnotify.h. Referenced by findExistingNotify(), LLNotifyBox(), and ~LLNotifyBox().